Did you ever wonder what the signs would be to indicate the end of the world? Some people say it’s major flooding, others say it’s major earthquakes. Personally, I think it’s the “arrivals at the TV Land Awards.” I do, however, think it is brilliant how they’ve assembled these cast of characters in one place at one time. 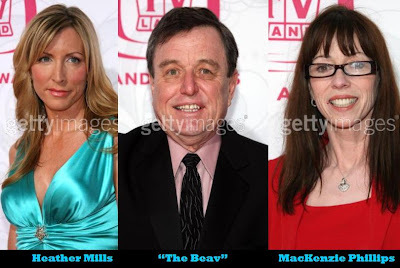 Some make sense to me since they were on TV shows back in the day like Greg and Marcia, Cindy, MacKenzie Phillips, etc. Some of the other guests make no sense to me such as Heather Mills, Heather Mills’ wooden leg, Anne Coulter (?? ), and Chyna Doll. Random, yet brilliant. If they could only give one award out the entire night it should have gone to Charo. I’ve said it before and I’ll say it again, Charo has made an entire career out of one two-word saying, “Coochie-Coochie.” Charo never breaks character. Ever. Under no circumstance does Charo do anything else but “crazy movements,” “crazy poses,” and make “crazy sounds.” Seriously, look at how she’s posing. You know, you KNOW she’s saying “Coochie-Coochie” we just can’t hear her…..because it’s a picture. Duh! Who Shot The End of the World!? !